Okay, I admit, these are not the most authentic Mexican quesadillas you’ll eat but I guarantee my Chicken and Jalapeño Quesadillas will be one of the most delicious! 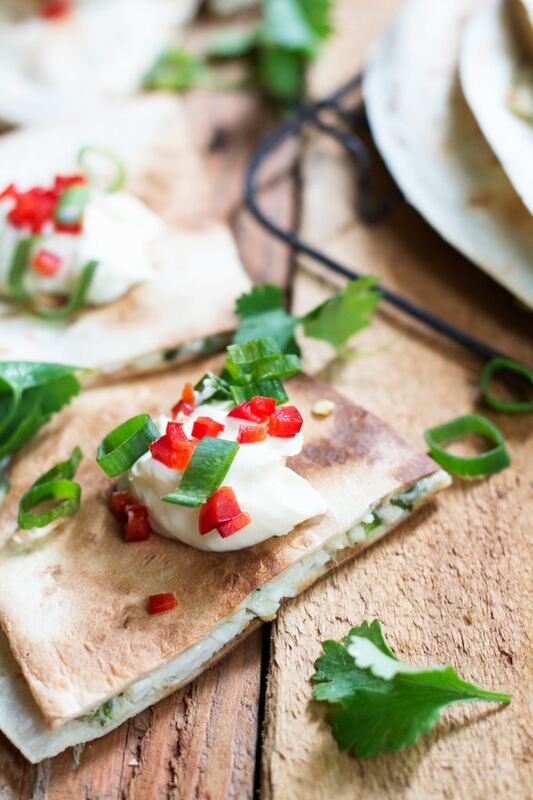 Crispy toasted quesadillas, creamy and gooey melted cheese centre with a little bit of zing from spicy jalapeños, cumin and coriander (cilantro). 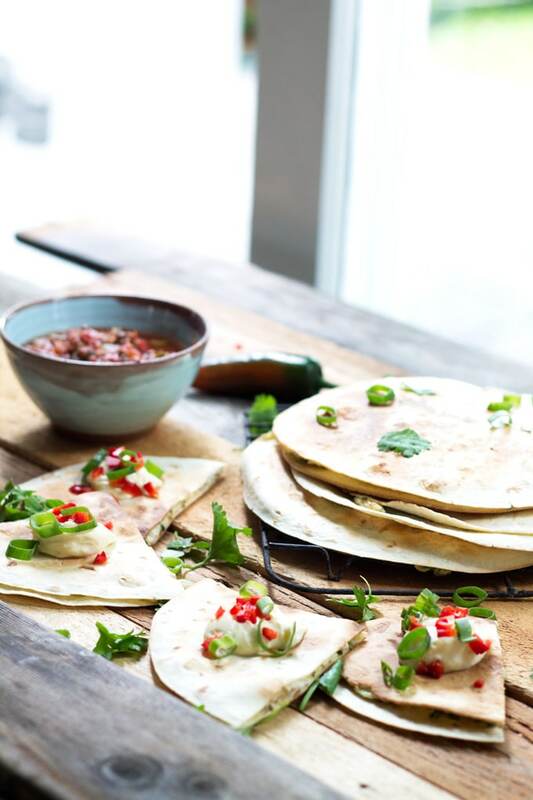 These are not entirely my idea, these are in fact my take on the quesadillas they sell at one of my favourite cafes, Five Loaves in Herne Bay, Auckland. I think I have sung their praises in the past because, seriously, they are that good. Their Chicken Caesar Wraps are the best sandwiches in town (if I haven’t convinced you in the past to try them then now is the time friends, go try one today if you live in Auckland) and the coffee is so good that my husband is convinced there must be something a little less than legal in there! I don’t have shares in the shop by the way, this is a genuine cafe-mance (cafe romance, see what I did there, okay it wasn’t that clever). Anyway, they have had these delicious chicken and jalapeño quesadillas there for a few years now and I have always thought they are to die for. I must admit, they are a little on the pricey side, $11 if I remember correctly, for a quarter of a quesadilla so in the past they have been a bit of a special treat. While I was studying I would get one before every university exam (and wear my lucky pants, ha!) I’m a little OCD like that which is ironic because I was studying psychology at the time. I also remember getting them a lot after George my toddler was born (that and the Caesar Wraps) when I had been up all night and thought ‘I deserve a treat’, I can always convince myself of that. I’ve had them so many times that it made me think that I could easily make my own version. So a little shredded chicken, two cheeses (yes, two, you can never have enough cheese), some spices and onion mixed together and grilled in a couple of flour tortillas and there you have it, delicious homemade Chicken and Jalapeño Quesadillas that really are as good as the original. I do prefer these with flour tortillas, but if you are gluten-free then corn tortillas are great, you will just need a few more. Pre-heat a dry fry pan or skillet over medium heat. In a medium sized bowl mixed together the first seven ingredients. Season with salt and pepper to taste. 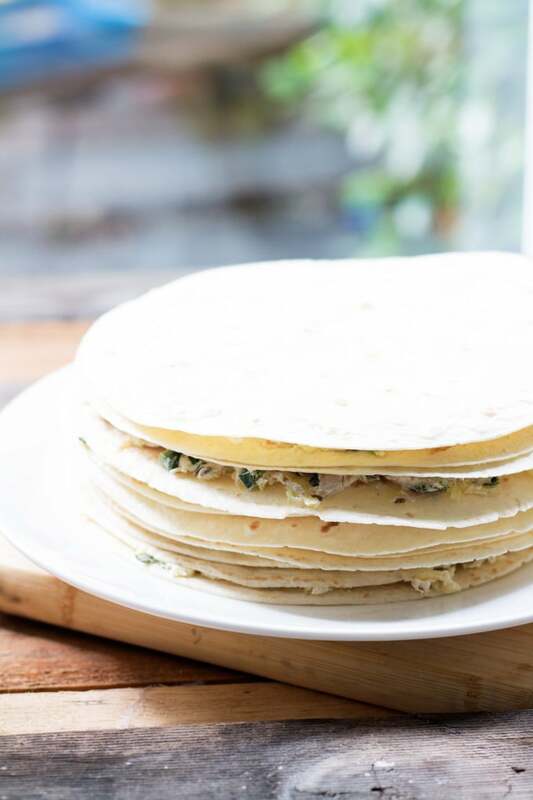 Divide ingredients between six medium sized flour tortillas. Top with remaining tortillas. 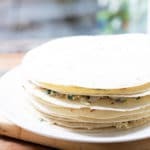 Place each quesadilla (tortilla sandwich) on the fry pan one at a time (depending on the size of your pan/grill) and grill for approximately 5 minutes each side or until the tortillas are turning golden brown, the cheese is melting and the chicken is heated through. I find it is easiest to turn the quesadilla using two fish slices. 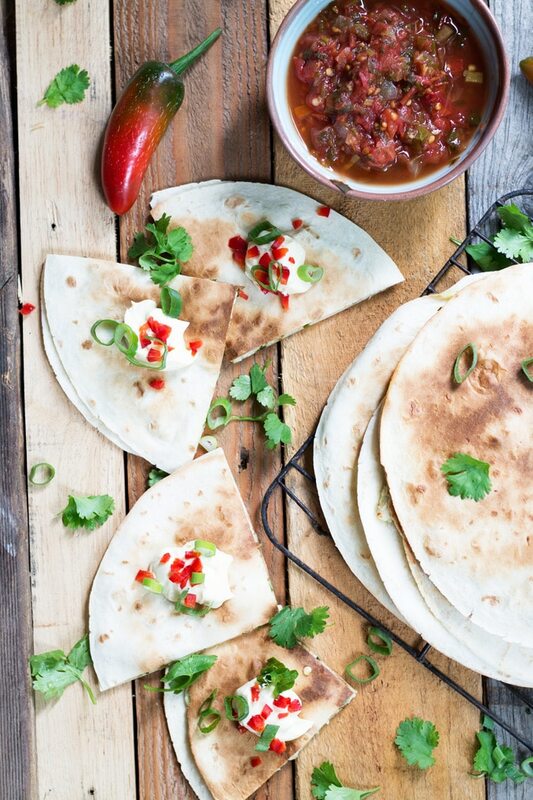 Cut quesadilla into quarters and serve with creme fraiche, extra chopped chilli, spring onion, coriander and salsa (store-bought is fine). Note 1: You can either use left over roasted chicken meat from a roast chicken the night before or roast two chicken breasts at 200C/390F for approximately 20-25min until the juices are running clear. Allow to cool then shred using two forks. Note 2: It is easier to mix the ingredients together if the cream cheese is at room temperature, but if you’ve forgotten to take it out in time just give it a good beat with a wooden spoon before adding all the other ingredients and that will soften it enough.